Scale model of a “Furban Malti” by Mr Ivan Cocker that partly inspired our Malta urban apparel and T-Shirt range. A Thousand years of licensed Piracy and Naval Combat. From Buccaneers and Privateers to the famous cutthroats declared ‘Hostis Humani Generis’ i.e Enemy of Mankind, forever immortalised during the Golden Age of Piracy . The tales of these Sea bandits stimulates our imagination till this very day. We have decided to promote our Corsairs’ story through our Malta urban apparel , T-Shirts and other original souvenirs . Our story, less mentioned yet nonetheless extraordinary takes us to the other side of the world, to a tiny island in the middle of the Mediterranean called Malta, in a time way before the Caribbean made its name as a pirate haven. Yet, as the years passed in the Mediterranean, a new breed of Maltese sea mercenaries was being forged from a race without options caught between the collapse and emergence of new vast empires. 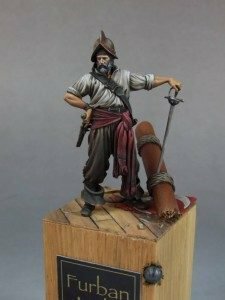 This is story of ‘Furban Malti’ (Maltese Corsair) and a lifetime of licensed Piracy. More than that, this is a tale of survival and desperation by a resilient people daily facing poverty, starvation, death and the possibility of slavery. Just as the Phoenix rose out of the ashes, in adversity so did the Maltese. Make no mistake, the Maltese were far from “helpless victims”. They hit back and hit back hard, relentlessly. The mere site of the Maltese flag would raise hell. Vessels would not leave port and those caught out at sea would surrender without a single shot being fired. Few had the stomach for a bloody battle against this indigenous race of experienced maritime warriors. Those they encountered may have called them Pirates, but to those back at home they were heroes, their stories the stuff of legends. We invite you to explore the history of your ancestral ‘Furban’ encapsulated in the coolest of formats on our merchandise, ‘Furban Malti’ Skull T-Shirts and articles. Ultimately it is the awareness of this tumultuous past which completes our shirts. It is the struggle, the journey of a legacy to where we are today that evokes pride.